A recent Mensa newsletter contained a letter from Malcolm Burn in which he says “History itself (or rather, the version of history which most people who are not professional historians think they know) is full of [...] myths. Sometimes people become so attached to them that, even when an historian has explained to them why a particular story is a myth, they dismiss the true version and still cling to the old familiar one.” I couldn’t have put it better myself – this is an old hobby-horse of mine. I mentioned it most recently in Chronological Snobbery. But the example given by Malcolm is one I hadn’t realized was a mythconception – I have to admit I always believed it myself! The essence of the “myth” is that when the British government switched from the Julian to Gregorian calendar in 1752, entailing the skipping of 11 days, hordes of ordinary people took to the streets with placards demanding “Give us back our eleven days”. Like many historical myths, people are inclined to believe this because it’s amusing, and it’s always presented as hard fact. But when you stop to think about it, the idea is pretty ludicrous. Why should “ordinary people” be so bothered by such an abstract item of government policy? According to Malcolm’s letter, the case has been thoroughly debunked by a historian named Robert Poole, who hasn’t found a single shred of evidence for popular protests on the subject anywhere in Britain during the course of 1752. Ordinary people are by and large sensible – they protest about things like taxes and working conditions, not calendar reform! The true origin of the phrase “Give us our eleven days” makes a lot more sense when you know the context. I’ve mentioned the great artist William Hogarth before (Paranormal investigation, 18th century style). There is no-one before or since quite like Hogarth. He produced fine-art paintings and engravings which, rather than dealing with the usual timeless subjects of high art, were satirical treatments of the fashions and politics of his time. 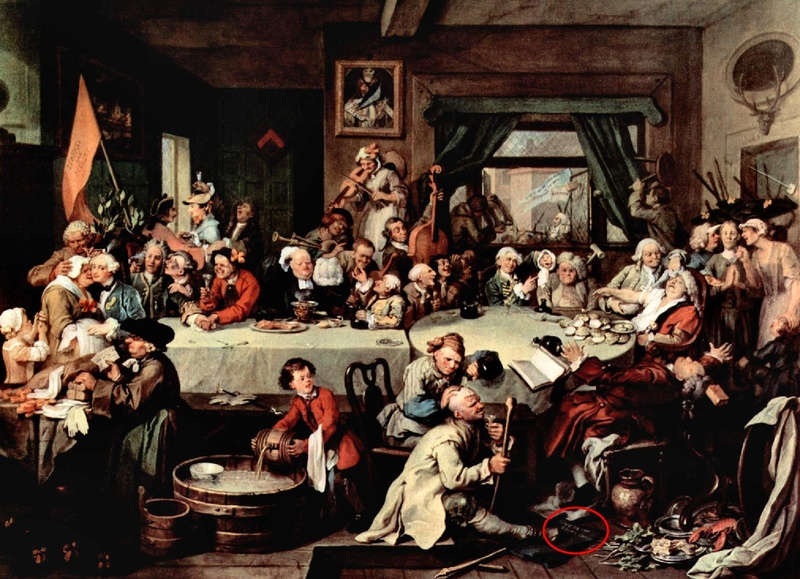 The closest comparison in modern terms is with a satirical cartoonist, although few modern-day cartoonists can expect to be remembered 250 years after their death, as Hogarth is. In 1754—two years after the calendar change—Hogarth produced a series of paintings called Humours of an Election. The aim was to make fun of the various goings on behind the scenes at a parliamentary election – an easy target for satire in those days just as it is today. The first picture in the series, "An Election Entertainment", shows a gathering of the Whigs (liberals) while their rivals the Tories (conservatives) cause trouble outside. The characters depicted in the scene aren’t “ordinary people”—as the “eleven days” protesters are imagined to be in the mythical version of events—but hard-line party faithful. They don’t think like “ordinary people” – they’re only interested in bringing down the other party. So there on the floor, amidst the Whig gathering, is a placard saying “Give us our eleven days” – the significance being that the calendar reform two years earlier was the work of the Tories. What Hogarth is doing is satirizing the way members of one political party will mindlessly oppose each and every policy of their opponents. The idea is that, if the Whigs had won the election, they would have reversed the Tory decision to switch to the Gregorian calendar. But that has nothing to do with the real world – it just came out of Hogarth’s imagination. Perhaps it’s a testament to his satirical genius that people continue to believe it really happened to this very day! Like you, I also had this little scenario tucked away as an historical fact. Thinking about why that could be, perhaps it's because it didn't have any significance in our respective conceptions of English society in that period? As is usual, it now seems blindingly obvious after reading your post. I can file it away, once more, as something like the popular myth that *everyone* once thought the world was flat. Sorry for the 24 hour delay before your comment appeared... I saw it via email yesterday but only just noticed it had been flagged as needing moderation. That doesn't normally happen, but maybe Blogger is getting stricter. I will be more alert next time!